Cosgrove Sanitary Station is a minor waterways place minor waterways place place on the waterways major waterways place village town city on the Grand Union Canal (Grand Junction Canal - Main Line - Gayton to Brentford) between Castlethorpe Wharf Bridge No 64 (Castlethorpe village is three-quarters of a mile north east.) (1 mile to the northwest) and Junction with Old Stratford Arm (1 furlong to the south). 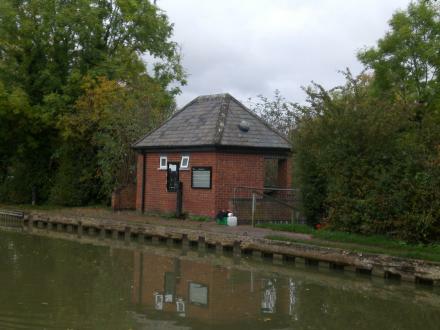 The nearest place in the direction of Castlethorpe Wharf Bridge No 64 is Cosgrove Visitor Moorings (Horse Tunnel End) (48 hour moorings); 1¼ furlongs away. The nearest place in the direction of Junction with Old Stratford Arm is Cosgrove Double Pipe Bridge; ½ furlongs away. Milton Keynes, MK19 — 1561 yards to the north. Navigation Inn, Thrupp Wharf, Cosgrove, Cosgrove, MK19 7BE — 1480 yards to the northwest. Northamptonshire, Buckinghamshire,, Northampton — 1515 yards to the west. Quarries Campsite Stratford Road,, Milton Keynes, MK19 7BD — 1227 yards to the west. no38 Vintage Emporium, High Street, Newport Pagnell, MK16 8AQ — 1145 yards to the south. Unit C, Lincoln Lodge, Castlethorpe, Milton Keynes, MK19 7JD — 119 yards to the south. Cosgrove, Milton Keynes — 439 yards to the west. 48 Bridge Road, Milton Keynes, MK19 7JH — 314 yards to the northwest. Milton Keynes, MK19 7JL — 212 yards to the north. Cosgrove — 1113 yards to the southwest. Cosgrove Park, Main Street, Cosgrove, Milton Keynes, MK19 7JP — 412 yards to the west. Cosgrove Park, Milton Keynes, MK19 7JP — 329 yards to the north. Cosgrove Park, Milton Keynes, MK19 7JP — 325 yards to the east. The Office, 5 The Stocks,, Cosgrove, MK19 7JD — 352 yards to the northwest. ACS Care Services, The Stables, Brook Farm, Northampton road, Cosgrove, MK19 7BB — 1625 yards to the west. Hanslope — 1505 yards to the southeast. Milton Keynes — 968 yards to the southeast. Milton Keynes — 413 yards to the northwest. Milton Keynes — 318 yards to the northwest. Milton Keynes — 1203 yards to the west. Cosgrove, Main Street, Cosgrove, MK19 7JP — 165 yards to the northeast. Manor Close, Cosgrove, MK19 7JG — 553 yards to the northwest.